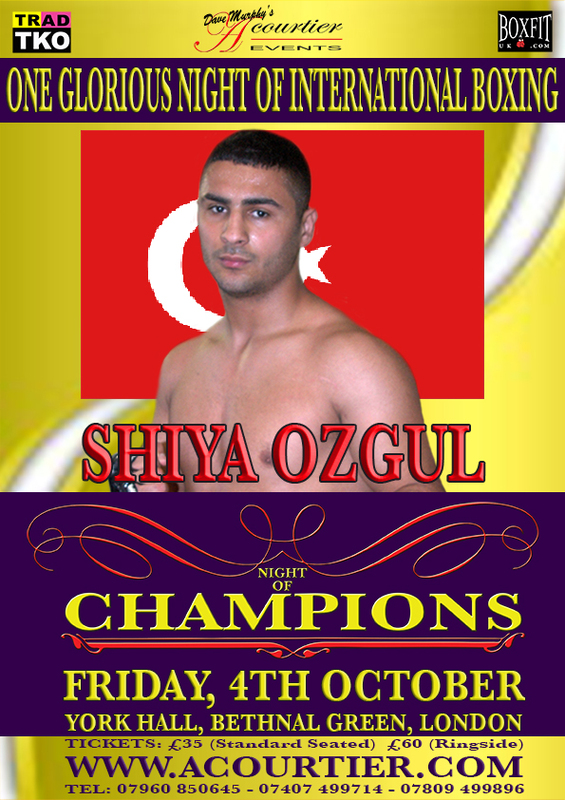 London based Turkish teen sensation Shiya Ozgul is set to make his professional debut, on the Dave Murphy, Acourtier Events promoted NIGHT OF CHAMPIONS extravaganza at York Hall in Bethnal Green, London on Friday 4thOctober. Just nineteen years of age, Shiya has already fought competitively over eighty times as an amateur, during which he represented his country in international competition on numerous occasions. The highlight of his stellar amateur career was being crowned Junior Champion in his homeland. Trained at the TRAD TKO Gym in Canning Town, by former Commonwealth Lightweight Champion Mo Hussein,young Shiya has proved to be quite a sensation, with his superb performances in sparring with the far more experienced pros there, even against some of the top prospects. Shiya possesses a style more suited to the professional game, so in some ways it comes as no surprise that rather than compete in his adoptive Country’s amateur competitions, Shiya has chosen to go the pro route, even at such a tender age. Following an earlier training session, with the aforementioned Mo Hussein, Shiya spoke briefly about his upcoming debut. “I am looking forward to fighting on October 4th. I should have debut already, but the fight was cancelled, I was ready then and I‘m more ready now. I liked fighting as amateur, but I fight like pro, my style is more pro, I want to fight pro. I have best trainer, Mo Hussein, he was a Champion, he knows what it takes to win. I’ve best training and sparring, have sparred with Erick (former English Light Middleweight Champion Erick ‘The Eagle’ Ochieng) and Festim (Lama). Shiya Ozgul,against a yet to be named opponent, features on the undercard of the Jennifer Rezke - Angel McKenzieWorld Championship clash, that headlines the Dave Murphy, Acourtier Eventspromoted NIGHT OF CHAMPIONS event, which takes placeat York Hall in Bethnal Green, London, on Friday 4thOctober 2013. Call – 07960 850645, 07809 499896 or 07557 641597 for further information.